Adventure (Module has a 3-in-1 sensor which combines digital humidity, pressure and temperature sensors in one). 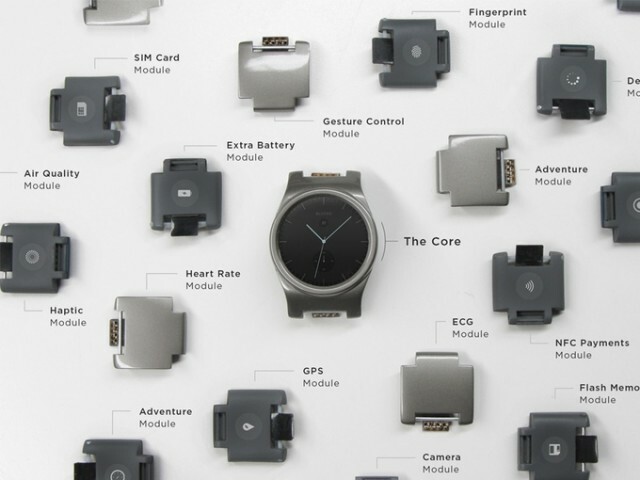 Four of the aforementioned modules come with the watch and the good thing is you get to choose all four of them. The BLOCKS smartwatch is expected to release in October this year and will be retailing for $330 with $11 in shipping costs if you’re in the US and $15 for the rest of the world (Pre-orders have already started). Additional modules can also be purchased separately which will cost you an extra $35 per piece. We really like the idea of customizing your watch according to your own needs and even though Motorola offer a similar option with the 2ndgeneration Moto 360, BLOCKS offers something uniquely different. If you’re on the lookout to get a new smartwatch running on Android Wear anytime soon, then you probably should wait a few more months. The BLOCKS smartwatch features a 1.39” full circular 400 x 400 Gorilla Glass AMOLED Round Display, a Qualcomm Snapdragon APQ8009w processor, 512MB RAM, a 300 mAh battery, 4GB of storage, a stainless steel casing, microphone, WIFI 802.11 b/g/n, Bluetooth 4.1 (BLE) and runs on the latest version of Android (Wear) Marshmallow. The watch is also fully compatible with iOS devices which will surely make Apple users quite happy. Even though the market for smartwatches hasn’t quite gone mainstream as anticipated, the modular technology might just be able to change this norm and in doing so, re-define the future of how smartwatches can be utilized. Let us know your thoughts on this in the comments below. Cheers!